R.J. Rushdoony: 00:02 This is R.J. Rushdoony, Easy Chair number 15, March 30, 1982. R.J. Rushdoony: 00:11 I have a number of subjects I want to touch on today, but before we get started on those, I want to pass onto you a bit of humor that delighted me no end, and I’ve been missing no opportunity to pass this story on to people. It’s about two retired big league ballplayers who enjoyed nothing more than watching baseball. Every afternoon they could go to the ballpark, they were there. If they were not there, they were watching a game on television. 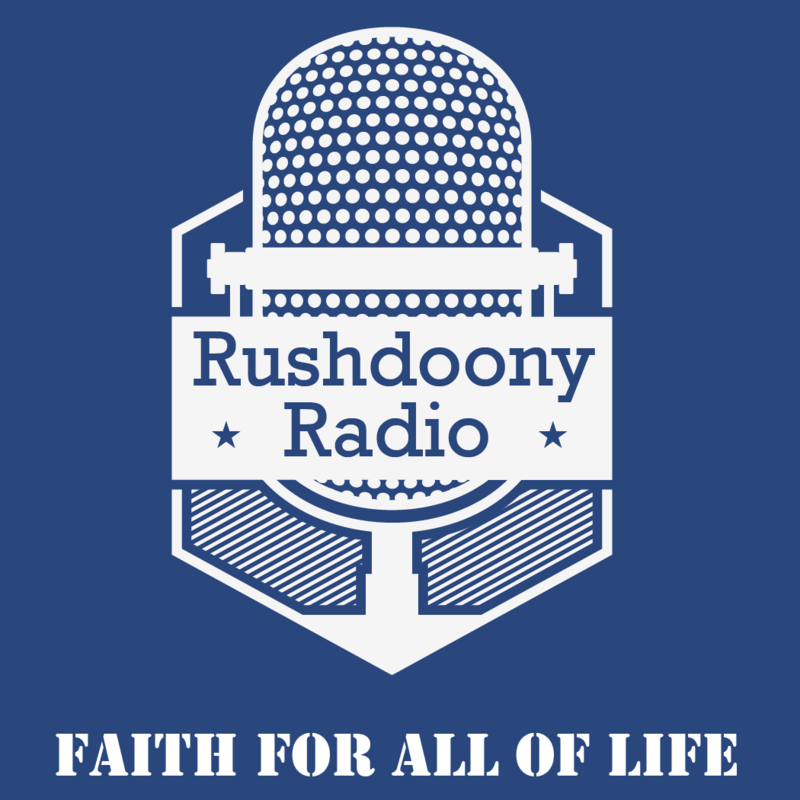 R.J. Rushdoony: 02:14 Now to go onto something else. Poland is very much in the news these days and with good reason. The Polish crisis is a very serious one. Polish productivity had fallen off dramatically. The economic situation in the country was declining drastically and the military took over, but this is not increasing productivity. It does not solve the basic economic problem. R.J. Rushdoony: 02:54 Last year, May 1981, in the Freeman Magazine, which can be subscribed to on a donation basis from the Foundation for Economic Education, Irvington, New York 10533. Hans Sennholz, an outstanding economist and professor and chairman of the Department of Economics at Grove City College wrote a interesting study, a very fine one, entitled Tensions in Poland. I’d like to read one paragraph from the concluding page because I think it is most relevant to our problem today. We talk about the difference between the military status of the Soviet Union and ours and so on. R.J. Rushdoony: 05:27 It’s a very important statement and one we need to pay attention to. There’s much more on the subject. I’m very grateful to one of you, Phil [Spielman 00:05:41], for sending me Andrew Racz’s newsletter. I don’t know what the subscription price to this is. It is, the issue I have, 18 very meaty pages. It is obtainable on subscription and I imagine it is a substantial subscription from A. Racz, R-A-C-Z and Company, 80 Broad Street, B-R-O-A-D, New York, NY 10004. R.J. Rushdoony: 06:27 A considerable portion of this particular letter or report is devoted to Racz’s testimony before the Gold Commission last November. Added to that is a great deal of substantiating data. The point he makes is that the Eastern Block countries are in desperate circumstances. He points out that in January 1982 the Polish government was desperately trying to raise half a billon dollars, 500 million. The same time, the Soviet Union was going all over the world trying to get loans, 90 million from Japan. Others of the Eastern European satellites were trying to pick up 100 million and 150 million from various banking circles in Western Europe. The Soviet Union itself is looking for 500 million from various sources. R.J. Rushdoony: 07:54 The Soviet Union, Racz points out, is near economic collapse and breakdown. It is facing monetary bankruptcy. Moreover, he points out, the fact is that without our aid, without the aid of Western banks and the United States loans, credit, and the like the Soviet Union would be in a very, very serious crisis and so would its satellites. Romania, for example, has a billion dollar debt, which has to be refinanced and which it cannot pay. As a matter of fact, Poland was not able to pay last year its interest to the United States to New York banks and the Soviet Union picked up the tab and made the payment. They made the payment for the simple reason that they wanted to maintain the credit in order to buy materials for their war in Afghanistan. R.J. Rushdoony: 09:26 No one could pick up the tab in the Eastern Block this past month. What happened? The administration picked up the interest payment. Nothing has been paid on the principle. That tab was $71 million. The banks throughout Europe and in this country, which made the loans, were very foolish. The civil governments throughout the Western world and abroad in the Far East that have made loans have been very foolish. In some instances, as with West Germany, we know that the banks were forced to make the loan by their civil government. R.J. Rushdoony: 10:23 Now, instead of saying to the New York banks, “You made that loan, you pay the consequences,” the administration earlier this month picked up the tab, $71 million in interest, which means that we are financing the Soviet Union. We are financing Poland and all the Eastern Block, so you and I are paying the interest to the New York banks for their stupidity and for helping finance Marxism’s war against us. R.J. Rushdoony: 11:05 Now, what are these loans doing? These loans are financing the war in Afghanistan. They are financing, as Racz points out very, very clearly, the massive arms buildup of the Soviet Union. They are financing what goes on in Latin America, including San Salvador. Where else could the Soviet Union get the money? It is financing what has gone on for some time now in Africa and Racz is very plainspoken. He calls attention to the fact that instead of armament on our part, it would be much cheaper for the taxpayer to say look, we can’t afford a huge defense budget. Let’s end the need for it by ending the loans to the Soviet Union, ending the credit that will knock the props out from the Soviet arms buildup. R.J. Rushdoony: 12:33 He says we have been financing the trouble in Central America, for the Cuban troops in Africa, the Russian grain imports, the military equipment sent to Vietnam to slaughter American troops, and we have hurt our economy badly in so doing. Racz said in his testimony what we need to do is to say let the federal government take over these loans. It’s cheaper to do so. It will eliminate the Soviet buildup if no more loans are granted to the Eastern Block, no more credit. Then we will not need our own massive arms buildup, but he says, unfortunately, the budget presented on February 8, 1982 by President Reagan and his advisers calls for a military outlay for the next five years representing a staggering one trillion, 600 billion dollars. The taxpayer cannot survive that very well. R.J. Rushdoony: 14:15 There is an easier way, says Racz, to win the Cold War. He calls attention to the fact that Karl Marx said the Western world and the capitalist system would collapse without wars, but he says the fact is it is the communists now who cannot afford wars unless capitalism provides the money to enable them to arm. R.J. Rushdoony: 16:57 I’d like to touch very briefly on something else. One of you, Nadine Weber, asked about the remarkable productivity of Japan. What is the reason behind it? Well, that’s an excellent question and I wish I could give a better answer. I can just outline the area where the answer, when it is thoroughly studied and researched, I’m sure is going to be found. First of all, in the early post-Reformation era, Catholic missionaries reached Japan. They made remarkable progress. A large number of converts were won. Subsequently, the Japanese civil government moved against them in an unrelenting persecution and the church went underground. When Christianity a few centuries later returned to Japan, some of these emerged and joined various groups established by the Catholic and Protestant missionaries. One group is still refusing to join any and although its faith is a rather garbled and inadequate one, it still maintains what it believes is the old faith or its surviving version of it. R.J. Rushdoony: 18:56 More important, when Christianity went underground, it emerged in a new character. It did blend with many of the Buddhist forms around it. It took many protective colorations, but it created a radically different character in Japan. In particular, there are some who believe that this underground Christianity and its byproducts led to the samurai warrior tradition. Thus, a very definite character in 101 ways, and I’ve just barely hinted at it, became a part of Japan as a result of this underground Christianity or the effects of this underground Christianity. R.J. Rushdoony: 20:03 Then there’s another factor, a very important one. When Japan was opened up to foreigners in the middle of the last century, a very interesting thing happened. For a long time, Japan had sealed itself off from the Western world. Except for a very limited contact with Dutch traders, Japan wanted no part of foreigners. However, once Japan opened the doors, the remarkable fact was this. The Japanese recognized the superiority of Western technology. They were most eager to adopt it and to make it their own. R.J. Rushdoony: 21:01 Now, the 19th Century was a great era of colonial expansion all over the world. In one part of the world after another there was resentment against this colonial expansion. Ironically, very often, not always, but very often this resentment came from those who had been most influenced by it. Thus, in Africa, it was precisely those who were educated by the colonial powers and brought up in the Western tradition who became most hostile to colonialism. R.J. Rushdoony: 21:46 What happened in most instances was, well, all instances virtually, they picked up Western political thought, but not Western free market economics. This is why British and French-trained colonial peoples who’d gone to Oxford or the Sorbonne and other universities, having no economics, went back and, with the liberation of Africa, created monster socialist states. All they knew was politics, no economics. What economics they got was socialist economics. Thus, a great deal of the hostility against colonialism was created by Western political thought. R.J. Rushdoony: 22:56 In China, of course, the hostility came from the very top, from the Chinese imperial line. Their unwillingness to believe that the West had anything that they could adopt and which they could use led to one disaster after another on the part of China. In some instances, too, as in the opium war, very brutal treatment by Great Britain, but Japan never took that course. Japan recognized the value of Western technology. It always had a substantial element that recognized that this is the way to go. As a result, Japan made every effort from the earliest years to observe and to imitate the West in its economic development in its technology. R.J. Rushdoony: 24:11 Now, because of a number of political developments, for a time, political power predominated over the economic and it led to World War II. After World War II, a great deal of the new thinking that emerged was, again, free market oriented. Much of this was the result of the work of one missionary, the Reverend Robert Sutton, S-U-T-T-O-N. Robert Sutton went into Japan shortly after the war. Most of his problems there, by the way, were with American missionaries who resented the work he was doing and his success. Sutton himself went there from the United States. Sutton soon began to exercise a tremendous influence for the free market from a Christian perspective. As a result, these ideas were fused with the Japanese tradition, with Japanese feudal loyalties, with the family concepts to give Japanese industry a particular vitality, a very remarkable one. R.J. Rushdoony: 25:46 Well, I did not intend to take as long a time with that and I can see that there are some thing I planned to talk about today that I simply won’t get to. What I shall do since we are on the subject of the free market is to pass on a few things from an essay in a book published in 1979 by the Heritage Foundation and the title is Capitalism: Sources of Hostility. It is edited by Ernest van den Haag, H-A-A-G, $9.95 from Epoc, E-P-O-C, Books, New Rochelle, New York. The book from start to finish is excellent. I’d like to touch on just a few things from van den Haag’s essay, as well as his introduction. R.J. Rushdoony: 26:58 He calls attention, and this is a little by the way from what I intend mainly to deal with, to the fact that Immanuel Kant, the great philosopher who is the founder of so much in the modern age, the source of it. Out of him came Hegel and then Marx, Dewey, and so on. The insane, Kant held, should be tutored by philosophers. The problem, the root cause of insanity, he said, is faulty reasoning. Therefore, experts in correct reasoning are most apt to be able to help them. R.J. Rushdoony: 27:47 Now, of course, we have not gone too far astray from Kant’s thinking. We’ve added faulty emotional problems to faulty reasoning, but basically, we are unwilling to consider the fact that reality is God created. As man departs from reality, he departs from God. As he departs from God, he departs from reality. Therefore, at the root of mental problems is a religious problem. The result is that it has to be dealt with essentially from religious perspective. It has been demonstrated that those who have had psychiatric counseling are worse off than those who have not. R.J. Rushdoony: 28:56 Well, now to turn to van den Haag’s opening essay and some of the other writers are outstanding scholars in this area. The attack on the free market has behind it a number of things. One of the essentials is that the intellectuals insist on viewing the world in terms of their own presuppositions. They have no sense of reality. R.J. Rushdoony: 29:49 Now, as a result, they are hostile to the free market system because it puts the world outside of their jurisdiction. It is not something for intellectuals to adjudicate, to control, to plan for. Rather, it is something that works. It works in terms, as Adam Smith said and others, the invisible hand. There is an order behind the world, in other words, a God-given order, but the modern intellectual, having abandoned God, sees no order in the Universe except a self-created, self-imposed order. R.J. Rushdoony: 30:49 Van den Haag thus, without going into these theological premises, nonetheless gets to a basic consequence of it. He says, and I quote, “The alternative to the market is bureaucracy, whatever label is affixed to it.” This is, of course, exactly our problem today. We have a growing bureaucracy because we have abandoned the free market and we have abandoned the free market because we do not believe in a God-given order in the Universe. Unless man, through the bureaucracy, creates an order, there can be no order. Hence, increasingly, we create federal and state agencies to provide that order. R.J. Rushdoony: 31:46 There’s a great deal more very important in van den Haag’s analysis. One of the points he makes is that the war against poverty, as it has been formulated by these intellectuals, can never be won. The reason for it is they have come to identify poverty with inequality, not misery and economic want. Now, the free market can take care of poverty. Inequality can never be overcome because there will always be those who are going to be more successful in the marketplace than others. As a result, the current definition of inequality renders the problem insoluble. R.J. Rushdoony: 32:58 Van den Haag has some important things also to say about the rich and how they bring up their children. He calls attention to the fact that wealth now produces guilt feelings as often or as much as it produces comfort. The rich seldom feel that their wealth is deserved and their children almost never do. He says one of the reasons for it is this. Until this century, children of the upper classes were reared to be heirs. They were reared to preserve and secure the status and fortune of the family. They were trained, educated, and, above all, disciplined accordingly. All their ambition, their expectations, their training was directed to the assumption of this role, but the situation, he says, has changed drastically. R.J. Rushdoony: 36:22 I was not alone in getting that kind of question. A good many of the other boys that I knew were asked the same thing. For many of them, the answer was very clear. They were going to grow up and run the family farm, but this kind of expectation was routine. After all, at that time, boys very often had to assume heavy responsibilities at an early age. Very early you started working to help out with things on the farm. I recall that one of my classmates, now dead, at the age of 11, when his father died, took over and ran the farm, did a good job of it. There were others like him. I knew several like that. R.J. Rushdoony: 37:30 Of course, that was nothing remarkable compared to what things were like a few generations before when young men were often captains of merchant vessels going around the horn at the age of 18. I’ve often cited the fact of Admiral Farragut. Admiral Farragut, at the age of 59, was a 50-year veteran of the US Navy. He had entered the Navy earlier as a cabin boy, so I believe he served about two years as a cabin boy before he was formally in the Navy. Now, I’m not advocating we go back to that kind of thing, but what I’m saying is we’ve gone from a concept of maturity, of calling being a consideration long before you graduate from college to a position where play is the permanent calling of most people. They work only to play. R.J. Rushdoony: 39:01 Now I want to turn to some poetry. I had a very important subject that I wanted to deal with, but I’ll wait until another occasion when I can give it more time. Some of the poetry I have read to you has been 20th Century poetry, poetry from the early years of the century to about 1930. I believe that some of the most lovely lyric poetry in all of history was written in those years by British and American poets. That great flowering, which while it produced no great poets, produced a great deal of very lovely poetry died. I’m going to read from one of those poets and I think you will see the reason why and I’ll discuss it briefly after before I go on to something else. R.J. Rushdoony: 43:35 This note of melancholy, of defeat, of the emptiness of life began to overtake those great lyric poets of then. The result was that little by little, the lyricism went out of poetry and what we have seen in recent years is poetry become an esoteric discipline. The idea of making anything understandable is beyond the modern poet. What he puts together are words without any obvious sense because meaning is anathema to him. He is only giving vent to chaotic thoughts and expressions. R.J. Rushdoony: 44:38 This has gone hand in hand with a moral and religious apostasy. The poets had nothing but death and, therefore, what did they celebrate? Moreover, their moral decline was such that they followed one byway after another. One could almost speak of the homosexual culture that developed because they soon abandoned normality for perversions in many, many instances. R.J. Rushdoony: 46:59 Well, Victoria Sackville-West was more honest than most contemporary writers in her elitism and in her contempt for the people. Her life was a miserable, wretched one. She was continually isolated from people. She hated her companions. She hated permanence. It’s no wonder that modern literature is what it is, but now to something much happier. R.J. Rushdoony: 47:51 I don’t think we appreciate very often the culture of Latin America. For one thing, because it’s different from us and because there is a great deal of political instability in that part of the world, we tend to look at it as inferior. Some years ago, Dudley Fitts, F-I-T-T-S, edited an Anthology of Contemporary Latin American Poetry. This came out early in the 1940s. I’d like to read to you some of the exuberant poetry from that volume. Of course, all this is in translation, so it doesn’t have the flavor of the original, I’m sure, but there is a vitality that comes through all the same. R.J. Rushdoony: 55:06 Well, these are delightful. There’s more like that. There’s one particularly lusty one from Haiti by Emile Roumer, The Peasant Declares His Love. “High yellow of my heart with breasts like tangerines. You taste better to me than eggplant stuffed with crab. You are the tripe in my pepper pot, the dumpling in my peas, my tea of aromatic herbs. You are the corned beef whose custom house is my heart, my mush with syrup that trickles down the throat. You are a steaming dish, mushroom cooked with rice, crisp potato fries and little fish fried brown. My hankering for love follows you wherever you go. Your bum is a gorgeous basket brimming with fruits and meat,” a real delight. R.J. Rushdoony: 56:13 Well, our time is just about up. I look forward to these Easy Chair sessions and I think as I read things that now there’s something I’ve got to share with everybody in the next Easy Chair. In between times, I am looking forward to these sessions and I simply don’t have the time to answer your letters, but I do enjoy them. I often think as a result of your letters something to include and it gives me a particular delight to do so. Well, thank you for listening again and God bless you.